Culver City recently released an iPhone application that lets residents report city issues – potholes, graffiti, noise – directly to City officials. 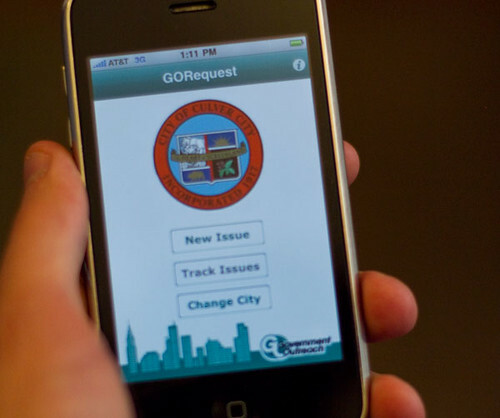 Users can simply snap a photo of the issue, choose which category it fits in, GPS location data is automatically included and with the click of a button the report is off to City Hall. Of course, this could be the equivalent of flushing your complaint down the toilet if there wasn’t a way to track the issue, but thankfully the app has that feature. This allows residents to see a problem through to completion – without the hassle of multiple phone calls or trips to City Hall. The GORequest application is the product of a collaboration with a 3rd party called Government Outreach that provides technology products to government agencies with the goal of improving customer service and increasing efficiency. In addition to Culver City, Government Outreach currently works with sixteen California cities including Santa Monica and Santa Clarita. Government Outreach has no transit agencies on its client list — it’s all city governments for now. But the possibilities are certainly intriguing: imagine a Metro iPhone application that allowed riders to report problems on the fly and track the progress as Metro staff works to solve them. Also, in these times of dwindling budgets, software like this could increase efficiency and service while reducing personnel costs to the agency. Metro staff tells me that as a public agency, and in the name of fairness, Metro can only work with companies like Government Outreach if they register as vendors and bid for projects such as the GORequest iPhone app.